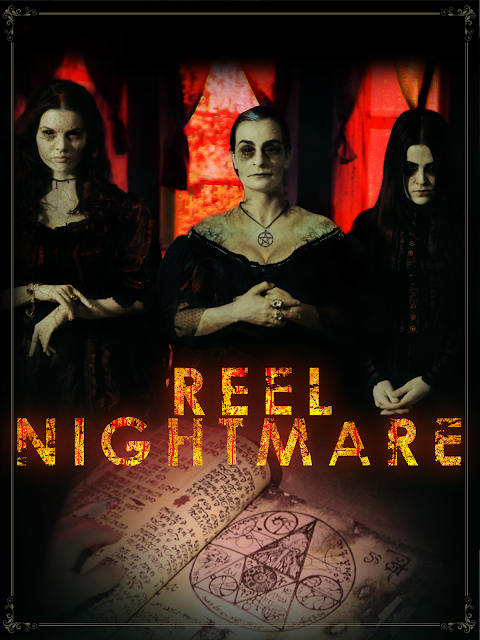 Reel Nightmare is an indie horror that was written and directed by Amand Petri (who also acts in the film). Upon starting this I recoiled in horror when on-screen text talked about some footage that had been found at a bizarre crime scene. 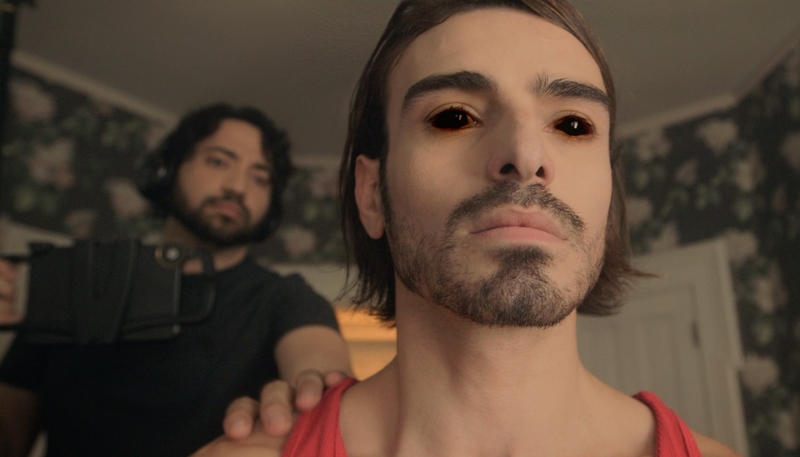 Found footage is a very over saturated genre, thankfully it is mostly found footage in name only, while characters are shown to occasionally be filming, the majority of this is far more traditional in the way it is shot. The intro features an online horror investigator who speaks about some footage hacked from the local Police showing what happened in the unexplained Goodwin Manor murders that took place three years previously. We then follow the exploits of a group of friends who have gone to a remote Victorian house in order to help Christian (Garrett Morosky) film his university thesis. These people include his older brother, cousin, best friend Sophia (Mary Elizabeth Winstead lookalike Madeline Heil), as well as video blogger Hassan (Petri) and a few others. A series of weird occurrences that include one of the group getting inexplicably sick, discovering the tyres on their car have been slashed, and the power to the house going off make the friends think that someone is messing with them, so they decide to hold up in the old house over night, so that they can get help in the morning. However the actual cause may be down to the spirits of three witches who once used to live in the mansion. This is obviously a budget film, as such there are issues with the film making. Sounds can often have a bit of an echo behind them, the acting while not terrible rarely elevates itself from being anything but average, the special effects can be at times awful (one scene involving books flying around was the best example of this), while not much really happens in terms of horror shown. I appreciated the found footage aspect not being adhered to, it was interesting how sometimes we would see shots from characters perspectives, but other times there would be over the shoulder shots of people filming. This does cause some issues later on when no character is shown to be recording anything yet this is still reportedly pieced together footage from the incident. The quality isn't bad, there are plenty of common shots such as inserts, reactions, as well as camera filters for visions and flashbacks. For me I felt there needed to be more focused camera work, there are often multiple angles used when ever the group talk amongst themselves that made these scenes needlessly appear fast paced. The main crux of Reel Nightmare involves members of the cast getting possessed by witches which results in their eyes going all black, these effects actually worked well, though less so is the way these people start trying to talk as if they are old fashioned people. It was hard to feel much fear about these possessed, they don't really do much, at least not until towards the films end. When the witches actually appear in person they looked ok, some sort of smoky effect used over the actresses that made them seem ethereal. While the actors were mostly acceptable Heil stood out as a good female lead, she was a bit of a feminist, and was assertive, strong willed, and not easily impressed by the bravado of the more stronger male characters. The script was sometimes a bit stodgy though, especially for her such as one of her more strange lines: "when you think about it, female directors are pretty much the witches of today"...um, ok, if you say so Sophia! On the flip side her and Morosky share a stand out believable scene when she discovers his slip back into drug addiction. The best male character here was Petri's Carlos who had some pretty funny lines that added a bit of brevity to the later half. One thing I did love about Reel Nightmare were the H.P Lovecraft references hidden though out. First off you have the Necronomicon that features heavily (the pages for this looked awesome), then you have the fact the friends are from the Miskatonic University, while later on a nearby town called Dunwich is mentioned. It's a shame there was none of the creeping dread of Lovecraft's stories though. The only time I came close to being frightened was a cheap jump scare that was made to scare the viewers, the people in the film don't even see the scare. While there is a decent enough body count by the end just not enough happens here, and then horror film tropes get in the way of the enjoyment. For instance after the first corpse is found people just start acting in the most unrealistic ways, seemingly barely caring. Also I felt the film ended a bit too abruptly for my liking.